St. Martin's Press, 9780312595692, 340pp. "She helps people put their demons to rest. " "But she has a few of her own "
In the lockdown ward of a psychiatric hospital, Dr. Nadine Lavoie is in her element. She has the tools to help people, and she has the desire healing broken families is what she lives for. But Nadine doesn't want to look too closely at her own past because there are whole chunks of her life that are black holes. It takes all her willpower to tamp down her recurrent claustrophobia, and her daughter, Lisa, is a runaway who has been on the streets for seven years. When a distraught woman, Heather Simeon, is brought into the Psychiatric Intensive Care Unit after a suicide attempt, Nadine gently coaxes her story out of her and learns of some troubling parallels with her own life. Digging deeper, Nadine is forced to confront her traumatic childhood, and the damage that began when she and her brother were brought by their mother to a remote commune on Vancouver Island. What happened to Nadine? Why was their family destroyed? And why does the name Aaron Quinn, the group's leader, bring complex feelings of terror to Nadine even today? And then, the unthinkable happens, and Nadine realizes that danger is closer to home than she ever imagined. She has no choice but to face what terrifies her the most and fight back. "Sometimes you can leave the past, but you can never escape. " 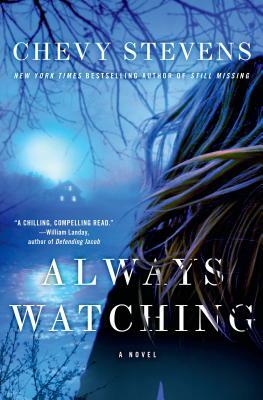 Told with the trademark powerful storytelling that has had critics praising her work as "Gripping" (Kirkus), "Jaw-dropping" (Publishers Weekly) and "Crackling with suspense" (People magazine), ALWAYS WATCHING shows why Chevy Stevens is one of the most mesmerizing new talents of our day.